The fifth Great Cosmic Wisdom of the Hindu pantheon is Tripura Bhairavi, correlated both to the terrible force of destruction of the evil and impure, and to the energy of the subtle universal fire. The implications of these aspects are numerous. For instance, the purification action performed by the Great Cosmic Wisdom Tripura Bhairavi implies the manifestation of Her saviour aspect, because She saves Her devotees from all suffering and negative karma-ic pressures. From an etymologic point of view, the name Bhairavi comes from three groups of letters, with a precise semantics: bha symbolizes the act of preservation, in the sense of continuity, ra signifies ramana, the creative divine activity and va coming from vamana, referring to the relaxation, or ceasing a certain activity. Consequently, Tripura Bhairavi represents Gods extraordinary power to create, sustain, and in the same time destroy the manifested world. Unlike the governing gods of the Hindu pantheon (Brahma, Vishnu, and Shiva) who rule only upon one of these functions, Tripura Bhairavi represents in full harmony two fundamental and apparently contradicting aspects of the manifestation. These aspects refer to the bright beauty and the terrible action in the creation. This perfect correlation of the divine attributes was stated also in the description of the Great Cosmic Wisdom Kali, however the Great Cosmic Wisdom Tripura Bhairavi represents specifically the terrible aspect of the divinity. In other words, She signifies Gods amazing, colossal, unmatchable, and terrible force of action, which destroys all that is bad and impure and in the same time transforms in the sense of evolution the various types of manifestation. From this perspective, these transformations are “rebirths” from the ashes and sublimations of the various aspects of the Creation. Consequently, the Great Cosmic Wisdom Tripura Bhairavi represents the transformational power of the subtle fire (tejas tattva). The great majority of the people perceive the action of this extraordinary divine force and energy as a terrible, scaring aspect, mostly because She causes the burning and destruction of all limitations, preconceived ideas, erroneous conceptions, and illusions regarding our individual existence. As we already mentioned, this terrible manifestation of the Great Cosmic Wisdom Tripura Bhairavi is always directed towards both the destruction of impurities (on their various levels of manifestation) and the elimination of negative forces and influences that tend to block the devotees spiritual progress. Although the Great Cosmic Wisdom Tripura Bhairavis terrible force is difficult to bare for many people, Her specific action is necessary for protecting us from harmful influences and for guiding us on the spiritual path. An eloquent analogical representation of the Great Cosmic Wisdom Tripura Bhairavis terrible action in the manifestation is sometimes materialized in a womans anger, of even more concretely, in the prompt, firm, and determined actions of a mother defending her children against an exterior threat. From a different perspective, correlated to some very subtle and fine aspects of Gods creation, the Great Cosmic Wisdom Tripura Bhairavi represents the supreme power of speech, whose deep nature is fire, according to the Tantric Hindu tradition. Thus, She represents the divine word, the creative logos in its non-manifested form, as pure and transcendent divine energy. In certain Tantric texts, this fundamental divine energy is associated to a sword that can cut through any opposition or negative manifestation. 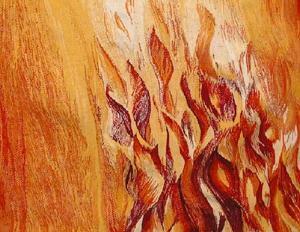 She is both the supreme divine light and extraordinary power of the radiating fire. Tripura Bhairavi represents the very flame of the divine consciousness, chid-agni, which is the Supreme Truth. 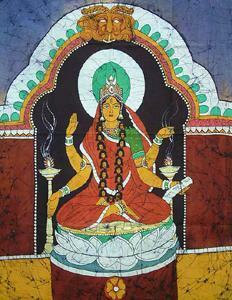 Another important element, known only by the initiates is that the Great Goddess, in Her radiant aspect, as tejas, the divine fire is the governess of the subtle and essential realities that define the five elements, mahabhuta form the creation and the sensorial perception through the five sense organs. These subtle realities are known as tanmantra and through them, the Great Cosmic Wisdom Tripura Bhairavi grants power and energy for the action and the manifestation of the elements and the senses. On the other hand, the Great Cosmic Wisdom Tripura Bhairavi is also known as Durga, the goddess who saves the devotee from difficult situations. 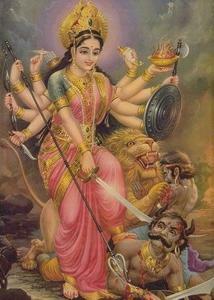 In most of her representations, Durga is riding a lion, a symbol of fire and solar energy. 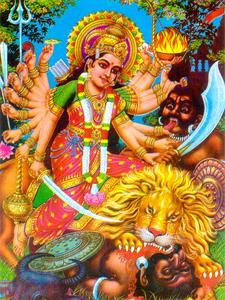 With a terrible and threatening attitude, Durga handles with great dexterity Her divine weapons, in order to destroy all enemies, demons, and disturbing negative forces alike. Consequently, She helps the devotee to overcome any sickness, sadness, suffering, and ultimately death. We may also note the close connection between Tripura Bhairavi and Tara, as they both represent the logos, even if under its different aspects. Thus, while Tara represents pashyanti vak, or the enlightening logos, Tripura Bhairavi indicates paravak, or the supreme, non-manifested logos. We may say that the enlightening logos on its highest level becomes transformed into the supreme divine light and the “warmth” of the divine consciousness of the Heavenly Father. This observation is valid in reverse as well. Thus, the non-manifested primordial logos symbolized by Tripura Bhairavi is gradually shaped through Taras action. The terrible form of the divine energy is manifested in the human being mostly as following the “transforming warmth and ardour”, the tapas. In its superior form of expression, tapas means the ardent aspiration that consumes and burns away the devotees all attachments, illusions and secondary desires. We may better understand this aspect if we remember that when we are truly interested in a certain aspect, we naturally and almost entirely become focuses in that particular direction that has caught our interest. We are no longer interested in the so-called “temptations” of the world. Analogically, the taps represents precisely this form of genuine, real, and complete interest in the spiritual life, resulting in the lack of other desires. This action characteristic to the tapas determines the appearance of heat generated by the force of the spiritual discipline and aspiration, which determines us to eliminate from our lives all that is unnecessary for our spiritual evolution. In this form of her manifestation, the Great Cosmic Wisdom Tripura Bhairavi is particularly worshipped by those who follow the path of the discriminating knowledge, raja yoga. As a natural consequence of Her divine protective action, the Great Cosmic Wisdom Tripura Bhairavi grants the capacity of controlling the senses, thoughts, and emotions completely, also helping the devotee to terminate successfully his or her spiritual actions that require discipline and sustained effort. Therefore, the wisdom of the Tantric tradition urges the practitioners to invoke sincerely and ardently the help of this Great Cosmic Wisdom, Tripura Bhairavi every time they have to deal with various obstacles or hardships in their spiritual practice. As we already mentioned in our previous articles, the Great Cosmic Wisdom Tripura Bhairavi represents the terrible form of manifestation of God. She is in close connection with Chandi, the terrible, “angry” aspect of God. 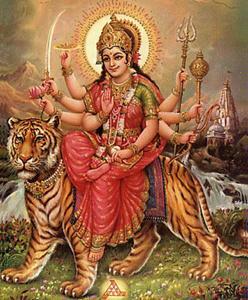 This goddess is at the same time the goddess worshiped in the famous Hindu poem “Devi Mahatmya”. This poem is also named “Durga Saptasati” or simply “Chandi” and it describes the way in which the Great Goddess defeats all demons opposing Her. This is partly why Tripura Bhairavi is also known as the “warrior woman”, who, through Her powers manifested as divinely inspired speech and extraordinary force of the subtle fire leads to a tremendous purification in the devotee’s heart. She eliminates all the obstacles standing in the path of the awakening and elevation of the devotee’s consciousness. In her aspect of Chandi, one can invoke the Great Cosmic Wisdom Tripura Bhairavi in order to eliminate the obstacles that tend to block the path towards pleasure, prosperity, harmony and spiritual freedom. 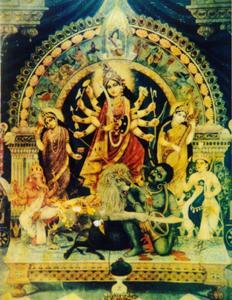 Another form of manifestation for the Great Cosmic Wisdom Tripura Bhairavi is the goddess Mahishasura Mardini, the ten arms glorious defeater of the demon Mahishasura, who is the embodiment of burning passions, especially sexual passions that tie the human being to this world of illusion and suffering through negative karma. As in the case of the Great Cosmic Wisdom Tripura Sundari, Tripura Bhairavi is “existing in and governing over the three worlds of the Creation”. 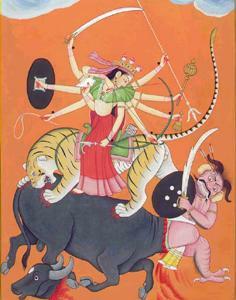 However, while Sundari signifies the beauty of the three worlds, Bhairavi represents their terrible aspect. This is an important indication of the fact that in reality, beauty and the terrible, frightening aspects are mere facets of the divine unity in manifestation. The tantric wisdom says that the human being goes naturally on the path from “terrible” to “beautiful”. In other words, first the devotee has to face the transforming action of the heat and light of the terrible spiritual fire (Tripura Bhairavi), and only afterwards he or she will get to enjoy the “cooling” and divine beauty offered by Tripura Sundari. On the other hand, the three-folded aspect of Tripura Bhairavi refers to agni (fire), vidyut (lightning) and surya (sun), which represent the three forms of light characteristic to the three worlds, the inferior world, the intermediary world and the superior world, corresponding to the physical, astral and causal universes. Tripura Bhairavi is also depicted in the form of the three goddess who defeated the demons, from the text Devi Mahatmya. These goddesses are Mahalakshmi, Mahakali and Mahasarasvati, representing the three great forms of Lakshmi, Vishnu’s consort, Kali, Shiva‘s consort, and respectively Sarasvati, Brahma‘s consort. These represent the three great forms of Tripura Bhairavi, as destroyer of the obstacles and hardships on the spiritual path. The Great Cosmic Wisdom Tripura Bhairavi is also the consort of Shiva in His frightening aspect, Bhairava. Bhairava was known as Rudra, the “angry” god, who was one of the most important deities in the ancient Vedic pantheon, from which later on the Hindu tradition took Shiva. Shiva is the peace and tranquility that follow after the terrible display of Rudra’s forces, whose main target is the “adjustment” of the devotee’s life to the parameters of the divine laws and harmony. From this point of view, Rudra represents the terrible power of the divine logos, and therefore Bhairavi, His consort, is also known as Rudrani. The subtle dwelling of Tripura Bhairavi is the subtle centre of force Muladhara Chakra, placed at the base of the spine. Tripura Bhairavi represents actually the ascension of the fundamental energy Kundalini and its purifying action on all the levels of the human being. In all traditional texts, Tripura Bhairavi is presented as radiating more powerfully than a thousand suns together. She has three eyes and wears a diadem made of precious stones, in the shape of a crescent moon. Her face is as beautiful as a lotus flower and Her expression is kind, happy and smiling. Her garments are red; Her breasts are stained with blood; She wears a necklace of skulls around Her heck. In two of her four hands, She holds a rosary and a book, and with the two remaining hands She performs the gestures of knowledge, Jnana mudra and the gesture of granting spiritual gifts and power, Varada mudra. Sometimes, instead of Jnana mudra She performs Abhaya mudra, the gesture of casting away the fear. In some iconographic representations, the Goddess is sitting on a red lotus and in others She is sitting on top of a corpse. 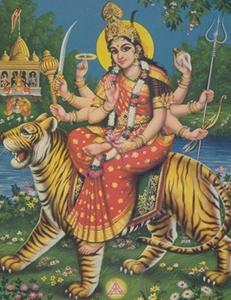 The main characteristic of Her physical form is Her radiating beauty, which is in close connection with the manifestation of the subtle element tejas. As to the ways to achieve the resonance with the sphere of force of the Great Cosmic Wisdom Tripura Bhairavi these are mostly related to certain types of meditation, of which the most important is the meditation on the divine inner light, which comes from the Supreme Immortal Self, Atman. Usually, this profound spiritual light is experienced through the third eye, Ajna Chakra. Nonetheless, the experience of the divine inner light is always accompanied by the experience of the inner sound. Another form of worshiping Tripura Bhairavi is the practice of the various forms of tapas. The spiritual tradition says that in the absence of the subtle, focused energy of the tapas, understood mostly as perseverance and continuity in the spiritual practice, the spiritual progress is not possible, it cannot evolve from a desideratum to an actual fact. A subtle form of approaching the taps, as a worship of Tripura Bhairavi is to gradually renounce all egotistic desires, all attachments and illusory pleasures in order to become free from the karma-ic prison. The highest form of tapas is that through one succeeds in obtaining the perfect control over the mind and the thoughts. Consequently, the highest form to worship the Goddess is to offer all our thoughts, with great sincerity and devotion in the sacred flame of the divine consciousness. To put it in different words, this means to “dissolve” the content of the mind, sublimating it thus entirely in the subtle sound of the mantra, which represents the quintessential manifesting nature of this Great Cosmic Wisdom, Tripura Bhairavi. 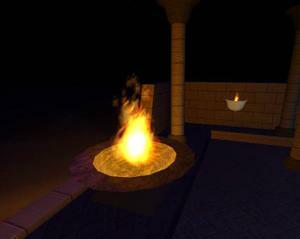 In the ancient times, the exterior form of Tripura Bhairavi was homa, the vedic sacrificial fire. This form of worship can be transformed into a subtle, inner form of worship through the offering of all the thoughts and emotions to the inner spiritual fire of the logos from Muladhara Chakra. This practically means the absorption of the mind from the senses, process that is resembling to the so-called sublimation of the sounds, from their physical form, as words to the “light of the transcendent tranquillity”, the non-manifested divine logos, situated at the level of Muladhara Chakra. In this way, the yogi who is perseverant and walks continuously the path of spiritual becoming will rejoice in receiving the Great Cosmic Wisdom Tripura Bhairavi’s grace. He receives significant beneficial spiritual powers as well as the state of enlightenment and ultimate freedom.